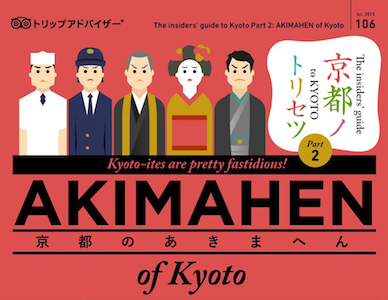 Welcome to the official portal of Kinukake-no-michi, the historic road that runs through the foothills of northwest Kyoto and links three World Heritage Sites – the temples known as Kinkakuji, Ryoanji, and Ninnaji. 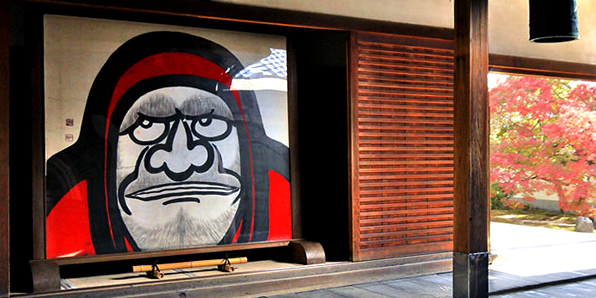 This website serves as a gateway to the must-see attractions and sights along Kinukake-no-michi. However, visitors who take the time to venture a little deeper will also discover some of the area’s other cultural, historical and recreational destinations. Enjoy your trip! 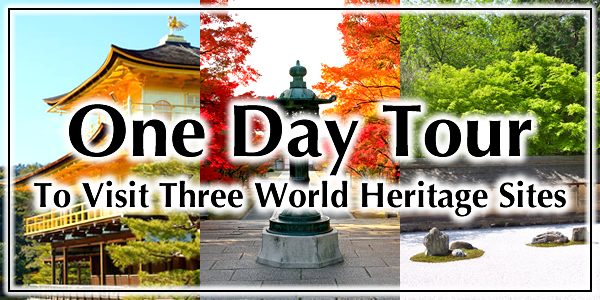 Transportation Take the Kyoto City Bus No.101, 102, 204 or 205 from Kyoto Station to the Kinkakuji Michi bus stop. Take the Kyoto City Bus No.12, No.59 from another part of the city to the Kinkakuji Mae bus stop. 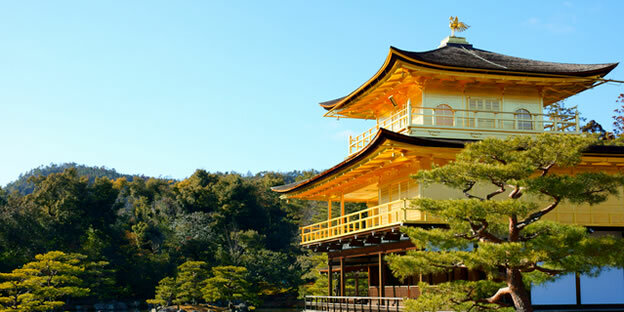 Kinkakuji, the Temple of the Golden Pavilion, is one the most iconic sights and popular attractions in Japan. It was built by the Ashikaga Yoshimitsu, the third shogun of the Muromachi shogunate, in 1398. Always a vision, its magical beauty is particularly captivating when a blanket of pure white snow sets off its golden contours, making Kinkakuji a still bigger draw on snowy days. 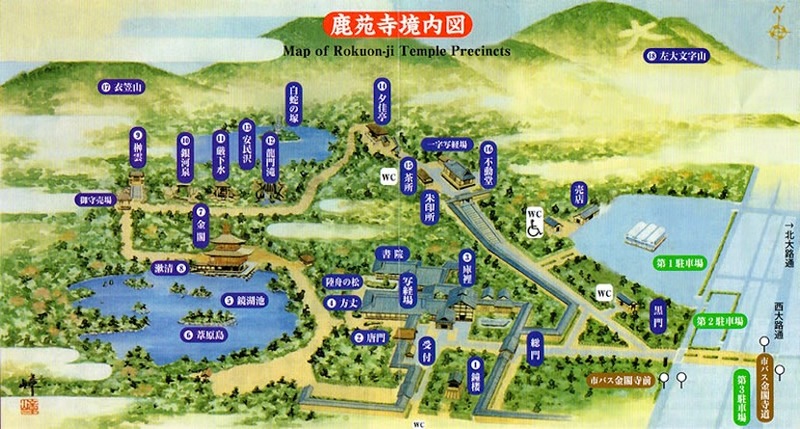 At the time Kinkakuji was built, the temple complex rivaled the sprawling Kyoto Imperial Palace Park (Kyoto Gosho), both in terms of the number of structures arrayed across the grounds, and as a political and administrative nerve center. However, the nature of Kinkakuji changed on the death of Yoshimitsu in 1408, when he willed the estate to Zen Buddhists, to be converted to a Zen temple. 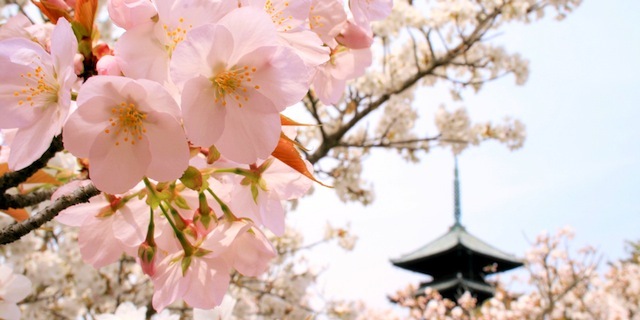 Except for the Shariden, the Golden Pavilion where relics of the Buddha are enshrined, the buildings were all donated to the Nanzen-ji and Kennin-ji temple sites. Nearly a century later, in 1498, the eighth shogun, Ashikaga Yoshimasa, commissioned the construction of Ginkaku-ji – the Temple of the Silver Pavilion – on a design that emulated Golden Pavilion at Kinkakuji. 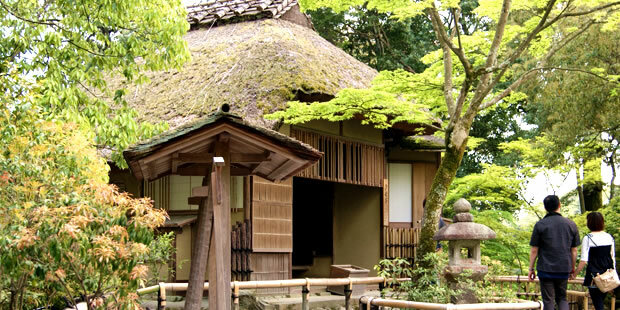 Each temple is considered a definitive representation of Muromachi Period architecture. Although Kinkakuji was designated a national treasure in 1929, its time in the incarnation for which it was honored proved fleeting: a novice monk torched the structure in 1950. That event, in turn, was fictionalized by Yukio Mishima in his signature masterpiece of contemporary Japanese literature, The Temple of The Golden Pavilion. Fortunately, it turned out that a team of engineers who had partially dismantled Kinkakuji for repair purposes in the Meiji Era had also created detailed structural drawings. 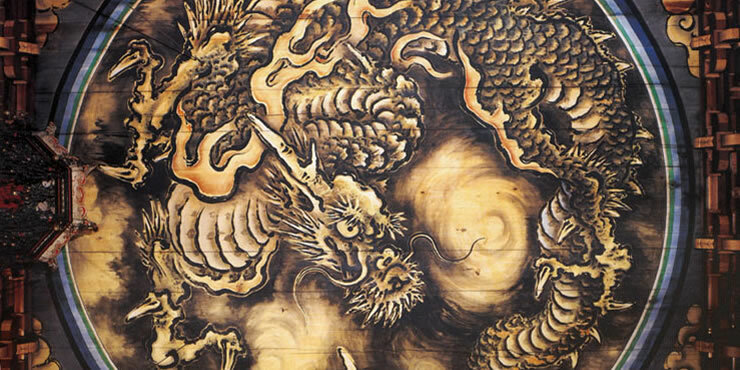 With the support of the Japanese government and contributions from local commerce and industry groups, the temple was restored in 1955, based on the Meiji Era drawings. Prior to its destruction in the fire, most of the temple’s original gold leaf coating had worn away. 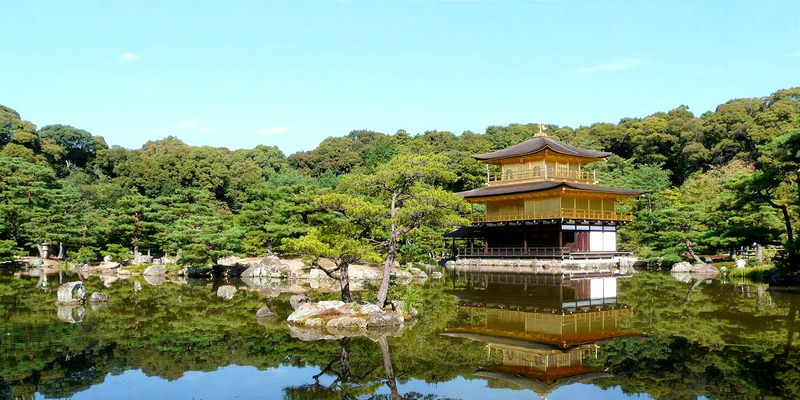 However, research conducted on Kinkakuji’s structural elements in the aftermath of the arson demonstrated that when it was built, gold leaf had covered the entire exterior, and this was reflected in the rebuilding. 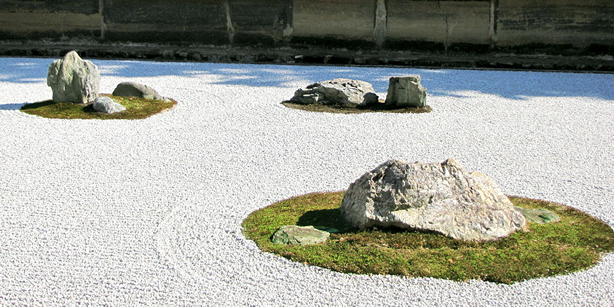 Thus, Kinkakuji as it appears today is a faithful restoration of the 500 year-old original design. 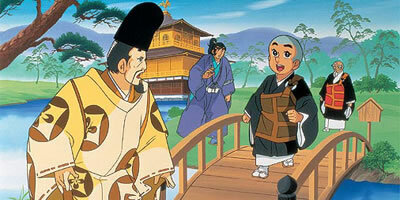 Kinkakuji was recognized by UNESCO as a World (Cultural) Heritage site in 1994.